This versatile, dual-function grill is every grill lover's dream. 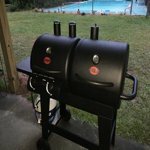 Incorporating charcoal and gas grilling in one unit, the Dual 2 Burner Grill provides 870 square inches of BBQ grilling and smoking space, as well as 262 sq. in. warming rack. This grill provides many notable features, including stainless steel heat gauges, cast iron grates, and easy-dump ash pan. The gas side allows you to cook up meals in a flash when you're in a time crunch or just need more grilling space, offering two main burners with heat tents. Add on a side firebox (sold separately) for great BBQ smoking and Char-Griller cover model# 5055 to protect your investment. This is an awesome grill. I love to be able to smoke and cook (low and slow as well as high temperature sear) all in the same package. 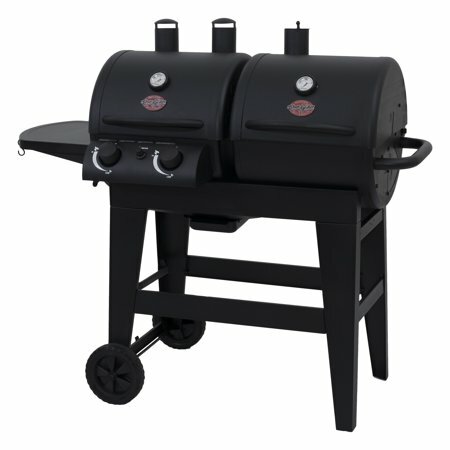 This grill allows the use of flavored woods to smoke, as well as the ability to exactly control the heat (easy to read gauges on both sides) with the gas grill for longer cook sessions. The surface area is good for small and large groups. I love cooking and smoking ribs on this grill! Ordering and pickup at Walmart was a snap, and the delightful young lady at the counter arranged for it to be placed on a cart, and an associate to help load it in my van. I would buy this grill again in a heartbeat! Ordering online and pick up at Walmart was easy peasy! Well built, fairly easy to assemble...used gas grill side and am very pleased. Would like a small "door" on charcoal side for adding wood/charcoal during grilling. Was a great purchase decision. Seem well made and replacement parts are available. Grill is a great buy!does a good job.